Established in 2003, Hirschfeld Fabrications is a full-service metal fabrication shop that prides itself on realizing your ideas with precision and accuracy. From custom furniture to kinetic sculpture and prototypes, Hirschfeld Fabrications’ work has been featured in ReadyMade magazine and showcased at United States Botanic Garden in Washington, DC. H Fab has also worked with a number of major Bay Area businesses and institutions, building custom pieces for everything from wineries and museums to major tech companies and sports organizations. 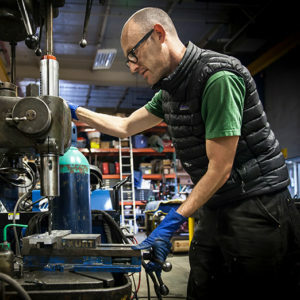 Located in Alameda, CA, and working with a collection of some of the very best modern tools and precision vintage machines, Hirschfield Fabrications provides a diverse range of products and services for both the individual and corporate client. Whether you bring a professional CAD drawing or a napkin sketch, H Fab’s skilled fabricators are ready to bring your ideas to life. Joel Hirschfeld is creative, meticulous, and passionate about metal fabrication. He loves coming up with new, innovative, and imaginative ways to do the best possible work for his clients. In his 22 years of experience Joel has made a name for himself as an expert welder of all metals. Joel enjoys collecting and restoring vintage American tools and machines, which he uses every day in the shop.